A remarkable blend of simplicity and highly-advanced DSLR capabilities, the compact and powerful D5000 offers breathtaking 12.3-megapixel image quality, along with a flexible, Vari-angle, Live View monitor for fresh picture-taking perspectives. Nikon’s EXPEED image processing further enhances performance, contributing to split-second shutter response and continuous shooting at up to 4 frames-per-second to capture fast action and precise moments perfectly. The D5000’s 24-fps HD D-Movie mode with sound captures video clips with amazing clarity–offering new and exciting creative opportunities. Fast, accurate 11-point autofocus with 3D Tracking, teamed with famous NIKKOR optics, assures incredible image sharpness, while active image sensor cleaning combats annoying dust automatically. Featuring a convenient built-in flash, 19 automatic exposure Scene Modes to make the impossible easy and 23 Custom Setting options to fit your preferences, as well as 14 in-camera image retouching functions, the D5000 is the perfect DSLR, beginning with performance to meet your picture-taking tomorrows. Outfit includes the 3x AF-S DX NIKKOR 18-55mm f/3.5-5.6G VR lens with image stabilization and legendary NIKKOR optical quality. Here it is! The infamous Nikon D5000 DSLR! Its a beauty! very sleek, sharp, precise and easy to use. I dont know why but the D3000 was so far off this one. When it arrived i immediately pulled it out and started attaching the lenses, adjusting settings, setting times and dates, etc. Both of my girls are starting to scare me by already knowing the brand. “Oh mom your Nikon came”. What 6 and 3 yr say that?? Ha! They wanted to see all the new features too. This camera has some neat stuff on it. You can take a picture, leave it on your card, go to the menu and completely enhance or manipulate the picture right then. We played around with the “Fish Eye” setting for fun. The screen is what makes me drool. Not only is this a flip screen, but it also rotates in 360 degree angle. Yes you can hold it above your head and still see by flipping the screen out, around and down. Makes my heart flutter. Playback and live positioning can be done on the 2.7 in screen as well. No more squinting through the mini peep hole (my words), which i find hard with glasses. Talk about alot of options! And let me tell you.. they work beautiful! No more of this, select one then try and alter more settings. Nope, very simple. Now the above photos, The birthday wishes one was taken using Candlelight. The Fish one was taken using High Key, and the rest i used Auto and Food. I was so surprised at how great the Birthday and Fish ones came out. Another great photo i got using the Nikon D5000 were the Tea Leaves on my Indonique Review. I was very thrilled at the crispness and clearness of them. I havent tried all the features on it yet so i will bring you back more reviews since i have another month with it. However i will say that hubby and i are seriously considering purchasing this one. I don’t have a bad thing to say about it yet. For any mom, i would say buy this one or the Nikon P90. That was the 1st one i reviewed and im still kicking myself for not buying it. I just was not thrilled with the D3000 so much. I felt like i had to “work” so much for the shot. The Nikon D5000 is a far improvement. 1 shot got that candlelight photo, 3 got the fish one. To me, i am on cloud nine! Well enjoy the pictures and information, i will be back in a few weeks with more, hopefully better photos. If you have any questions, please ask below. Also any hints or tips would be great! 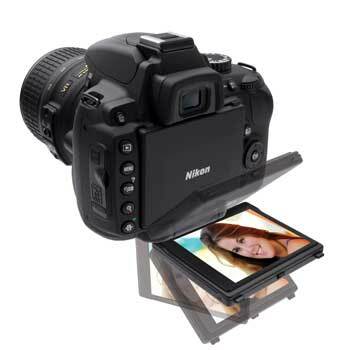 If your looking for a really great deal on the Nikon D5000 DSLR, Amazon has it for $664. Wow totally awesome! Great pictures.. So now your decision us p 90 or the 5000… I love how the screen rotates.. I saw a camera one time that allowed you to do all the editing right then… wow… made me get the chills.. this thing seems so awesome!